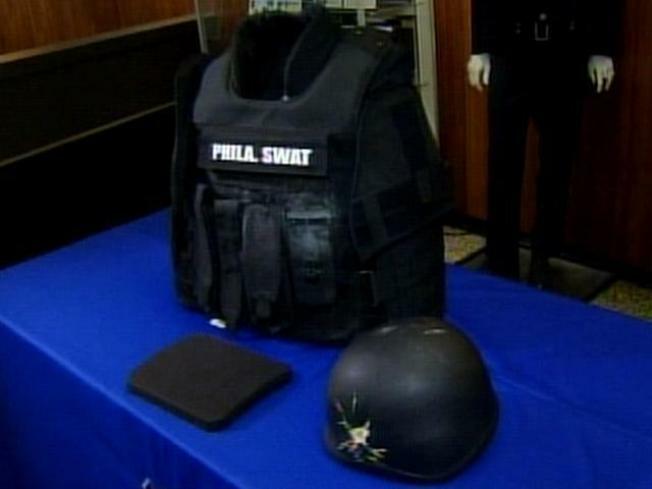 "We might have been planning two funerals today..."
The right decision and the right gear saved the lives of two Philadelphia police officers Wednesday morning when they tried to arrest an accused cop-shooter. "It's nothing short of miraculous that our two officers are here with us today," Deputy Commissioner Richard Ross said. The SWAT officers went to a Summerdale home around 4:30 a.m. to pick up Nasuil Martinez. He's a suspect in the December 10th shooting of Officer Kevin Gorman, who survived being shot in the shoulder. When Sgt. Christoper Binns and Officer Francis Whalen got to the home, Martinez fired what could have been fatal shots at both of them, police said. Whalen's protective vest stopped the bullet meant for him and the bullet meant for Sgt. Binn's head was stopped by his helmet, police said. "It kinda knocked him [Binns] around a little bit, but he never lost his footing," said police. When the officers shot back, Martinez barricaded himself in the basement. While he was on the phone with police and in the process of surrendering, police say Martinez accidentally shot himself in the neck and was later hospitalized in critical condition. Late in the afternoon, police showed off the vest and helmet that saved the officers, and credited a quick-thinking commander for sending out the SWAT team instead of patrol officers. "We might have been planning two funerals today because either one of these shots, you know, would have taken a life," said Ross.